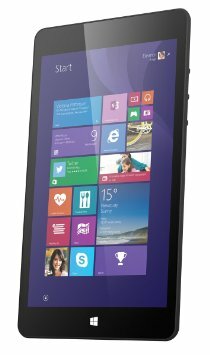 This 8-inch sub £100 Windows 8.1 tablet is one of a bunch of cheaper tablets that Microsoft seem to be encouraging, not least with the inclusion of a free year’s Office 365 suite. 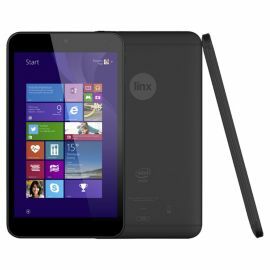 The Linx 8 (and its smaller 7″ brother) made headlines in the UK through stores selling it for under £50 with a trade in offer before Christmas. Even at the normal price, this tablet is actually a pretty good bargain, undercutting a lot of Android tablets and, of course, the iPad. Build quality isn’t too bad, it has a softish plastic back that houses the camera lens (a little too near the surface, but that shouldn’t be an issue) and the matt black finish with the grey Linx and Intel logos make it look business-like without being boring. The thin bezel means that the 8-inch screen doesn’t add a lot more space, useful for those who already own bags and cases for 7″ tablets that might actually fit this, and a single virtual windows key on the front as the only button. On the side of the tablet there are the usual power and volume up and down buttons, which are nice and tactile. On the top you’ll find a USB Micro port for charging and USB in/out, a headphone socket and a mini-HDMI for TV out. The other side to the power buttons houses a Micro SD port. Once booted, this machine is pretty much the same as you’d expect a Windows 8.1 laptop to be. Anyone who already has a PC or laptop set up for Windows 8 will have their settings and apps imported if they wish. It’s an interface that works well on the Windows panelled home screen, but as a low priced tablet device it’s perhaps even more surprising at just how smoothly this all works. It becomes even more impressive when you find yourself on the more traditional desktop, with the folders and icons that older Windows users are more familiar with. Other than the lack of a physical keyboard, everything is the same as you’d find it on a PC. Adding peripherals is easy using a Micro USB to female USB lead (available on Amazon for a few pounds) or, even better, a Micro USB hub that lets you connect multiple USB and memory cards to the single port. This allows you to use mice, keyboards and anything else that can connect to a PC. Bluetooth keyboards and controllers can also be used. The Intel Atom chips we previously used in Netbooks and this newer chip is pretty speedy. Unfortunately, it’s coupled with only 1GB memory, which does let it down in more graphic intensive applications, but I’ve tried the device with Photoshop and it runs fine. Being a PC, it can also run Steam for games (Tomb Raider and GRID were playable in their lowest settings) and any other PC program, only restricted by the onboard 32GB memory (about 20GB useable) and any Micro SD or USB drive attached. Overall, then, for a sub £100 Windows tablet this is pretty impressive and looks good enough to take to meetings in the office and runs surprisingly well. The recent announcement from Microsoft that all (or most) Windows 8.1 devices should get Windows 10 for free is even more of an incentive. Update: Windows 10 is working and actually further improves the device by giving it more space (as long as you delete the old files) and giving you a better set of options for desktop or app based screens, or a mix of both with the new Start screen. Another upside is that this device can actually be used as a Steam streaming device by plugging it in to a TV and streaming from a PC in another room. Ideal if you don’t want to spend the extra on a Steam Link. I’ve been surfing on-line greater than 3 hours today, but I by no means found any fascinating article like yours. It is lovely price sufficient for me. In my view, if all webmasters and bloggers made excellent content as you probably did, the net can be a lot more useful than ever before. Woah! I’m really loving the template/theme of this site. It’s simple, yet effective. A lot of times it’s hard to get that “perfect balance” between superb usability and visual appearance. I must say you have done a amazing job with this. Also, the blog loads super quick for me on Chrome. Outstanding Blog!